A noisy crowd welcomed both sides on to the pitch, but the home crowd were quickly silenced as the young Red Devils opened with a pace an intensity which the Blades struggled to match. 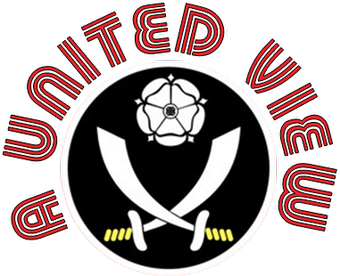 The time and space afforded to the Blades by semi final opponents Aston Villa, which allowed them to play their passing game, maintaining possession for long spells, was not on offer from the visitors. Harried and hassled by opponents who looked physically bigger and stronger led to possession being lost and misplaced passes. However, unlike when the Blades first team misplace a pass, there were no catcalls or groans of discontent, just encouragement and patience. Despite being on the back foot, the best chance in the opening stages fell to the Blades, with Corey Gregory heading over whilst well placed. At the other end of the pitch the movement of the Red Devils' front players started to pull the Blades defence around. They then made their possession count when Lingard gave them a fortuitous lead, his shot looping off keeper George Long with Maguire unable to stop it on the line. Some thought that it hadn't crossed the line and it took referee Oliver several seconds before he gave the goal. The issue muddied further by Maguire's flailing hands being raised as he cleared. From my viewpoint behind the goal there was a fear that he had patted it away with his hands, although replays suggest a lack of contact and that the ball didn't cross the line. Certainly to the naked eye it was hard to tell how he cleared it, in the end it came off his head on to the crossbar and out. The visitors built momentum on the back of taking the lead and George Long in the Blades goal continued to show the impressive form that saw him make his first team debut at the end of the season. Impressive one on one stops from Morrison amongst others and he continued in the same manner during the second half. The Blades eventually started to settle and late in the half a break from the back by captain Elliot Whitehouse saw him eventually lay the ball off in the centre circle to Callum McFadzean. The young left winger who took the ball on into the space ahead of him, before unleashing a bullet of a shot straight into the bottom left hand corner. A fabulous strike from the youngest Blades player on the pitch and an example of the ability which has seen him playing above his age group for much of his academy career. The Blades opened the second half much sharper, improving the possession stats with better ball retention and creating more chances than the visitors with better link up play and Slew ever willing to turn and run at the Manchester defence. The visitors were by no means out of it though and, after a spell of Blades dominance including having a shot cleared off the line, a very open game ensued with both sides finding plenty of space, particularly in wide areas. However, slightly against the run of play, the visitors again took the lead. The Blades getting caught out down their left, after an earlier warning went unheeded. The cross could only be deflected by Long into the path of Will Keane who tapped in with ease. Within minutes the Blades were back level with the ever willing Slew willing to take on the shot and a deflection looping it past Johnstone. Further opportunities fell to both sides, with an majority falling to the visitors and Long again came to the fore with several vital blocks. A 2-2 draw sets up beautifully an intriguing second leg at Old Trafford next Monday and an appreciative crowd applauded off both sides for what had been an evening of good football, open play and a demonstration of plenty of promise for the future for both sides. For the home side, George Long pulled off some great saves, a couple with his feet and shows confidence in his actions. Commanding his box well, he looks like a keeper with instinctive actions and could have a key role for the first team in coming years. He played a large part in ensuring that the tie is level going to Old Trafford and will be just as vital next Monday. Up front, Slew and Ironside worked tirelessly. Ironside perhaps not as effective as in the semi final, but Slew's running in particular pulled defenders out wide creating space for others. His raw pace and willingness to turn and run at defenders is a commodity that has been rare in the Blades first team for some time. He was also willing to take on a shot, often out of nothing and that paid off for the goal. With little room to play with he squeezed out a shot off the defender and in. At the back, Maguire and Kennedy faced a difficult challenge against the highly rated Will Keane and the deeper lying Ravel Morrison. They stuck to their task well, although you feared for them every time Morrison picked the ball up and ran at them. Maguire certainly has benefited from his first team experience and any player that puts Craig Bellamy on his backside so early in his career lacks little confidence. Kennedy looks a more accomplished footballer, yet without a significant late growth spurt you have to assume he would look to a different position in senior football. Both sides found space out wide and it's fair to say full backs and wingers on both teams impressed more going forward than for their defensive capabilities. The midfield battle was intriguing. Both Tunnicliffe and Pogba impressed for the visitors. The Frenchman showing some brilliant touches, but also a fragile temperament. His run and lofted pass to the wing that led to a first time cross and a tap in for Keane was sublime. Judged to perfection dropping on to Lingard's boot for a volleyed cross. Other times Pogba's more casual approach led to passes not finding team-mates and a frustrated flailing of arms, seemingly because they were not on his wavelength. There was enough skills on show to see he is something special but will need careful monitoring. Tunnicliffe was less noticeable in many ways, but for positive reasons and played the game with an ease and comfort on the ball which suggests both could step up to the first team over the next 18 months. Long denied him the chance to be a match winner in the last couple of minutes and my only criticism would be that he seemed to delay his shot too long allowing the keeper to close down the shot. Pogba and Tunnicliffe were up against a more diminutive midfield pairing of Harriott and Whitehouse for the Blades, their physical size making them look like under 12's in comparison. Unsurprisingly they lost the physical battle against the Reds' pairing for much of the game, but they more than held their own in footballing terms. More often than not they were the driving force, bringing the ball out of defence and putting the Blades on to the front foot, particularly in the opening stages of the second half. Late in the first half, it was a dogged run out of defence by Whitehouse, shrugging off several challenges and a tussle with Pogba, that led to the ball being laid off to McFadzean who advanced up field to strike the Blades' second goal. The central attacking pairing for Manchester United impressed greatly. After Will Keane's hat-trick against Chelsea in the semi final against Chelsea he was kept relatively quiet last night, his goal being a simple finish into an open goal. What impressed more was his work rate and movement off the ball. Easy to dismiss as a lanky target man, his movement and turn of pace is very good and, largely on his own, he led the line well. The main attacking threat came from Ravel Morrison who showed glimpses of why, providing his personal life remains on the straight and narrow, he has the potential to go the very top in the English game. He had very much a roving role, in the mould of Wayne Rooney, coming deep to collect the ball and link play before bursting forward towards the Blades defence. His turn of pace was blistering and it took a good save by Long first half when Morrison eased free of the Blades defence. As the match wore on he clearly tired and came deeper and deeper for the ball, once or twice popping up in front of his back four, but always trying to make himself available to accept the ball and keep play moving. You can see why both Keane and Morrison are highly rated and how the young Red Devils scored three against Liverpool and six over the two games against Chelsea. It could be another difficult night for the Blades defence at Old Trafford, but I am sure they will have learnt a lot last night. Leaving the ground, the match left a warm glow as the sun went down and the temperature dropped. Football being played the right way, with short sharp passing to feet. Players of promise, some of whom you could potentially see in big tournaments in 4 years time. Sportsmanship, with a lack of histrionics and very few bad tackles. A Manchester United player took a nasty tumble after a nudge over the advertisement hoardings, but just got up, brushed himself down and ran back on the pitch to get on with the game. No petty repercussions or revenge. An appreciative crowd that warmed up as the night progressed to create a friendly and encouraging atmosphere. And Blades Academy Manager John Pemberton, resplendent in woolly hat, rocking backwards and forward on the edge of his technical area like a modern day Randle McMurphy. I look forward to more of the same at Old Trafford next Monday. United had 7 players starting, against chelsea I think it was, who had been at the club for over 10 years, so a bit harsh to say they are all bought e.g local lads Tunniclifee and Morrison to name just 2. Only the few foreign players are not true youth products of the Manchester United Academy. They're not Arsenal or Chelsea! wilson1889 - Of the MUFC players out there last night, Johnstone, M Keane, Thorpe, Lingard, Tunnicliffe, Morrison and W Keane are all local lads and have been in our academy for at least 7 years, longer in most cases. Same goes for Tyler Blackett, who would have played if not suspended. The Youth Cup's an U18 competition and our lads are just as eligible as yours - not reserve players by any means. Might want to check facts in future. Great report Ian, very balanced, couldn't disagree with anything there. Looking forward to Monday. Thanks all for your comments. On the point about players from other clubs, to be fair, we had Harriott (who we signed from Luton's Youth set-up) and Barry (who was part of an Irish link up we have with Arklow Town). Certainly not Ajax or Le Havre, but we operate in different spheres for obvious reasons.